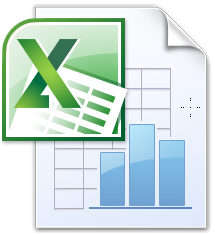 Microsoft Excel allows you to perform various types of math calculations—which saves you precious time and effort. However if you want to perform sophisticated calculations with greater convenience, it is essential that that you know how to change numbers to negative and positive values. After reading this guide, you will learn how to do this with ease. Select the number you want to change the value of. 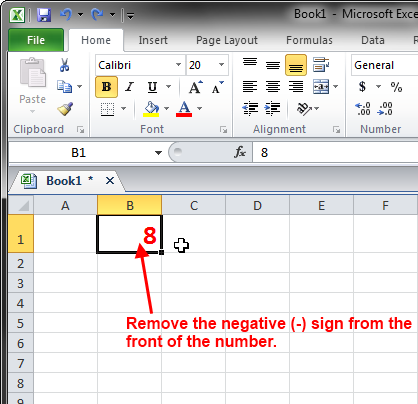 Change the value of a positive number to negative. 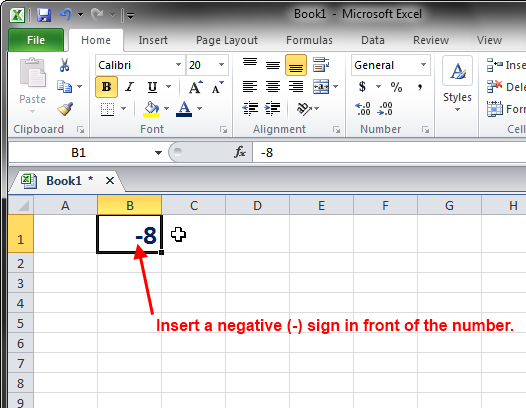 If you want to change a positive number to negative, simply insert a negative (-) sign in front of it. For example if you changed 8 to a negative value, it will look like this: -8. Change the value of a number to positive. Likewise if you have a negative number, simply remove the negative (-) sign that is in front of it. For example if you changed -8 to a positive value, it will look like this: 8. Multiplying two negative or positive numbers gives you a positive number. For example, -1 x -1= 1. Multiplying a negative number by a positive number gives a negative number. For example, -1 x 1= -1. Thus if you a multiply a row of negative numbers by -1, all the numbers in the row will become positive. Likewise if you multiply a row positive numbers by -1, all of the numbers in the row will become negative. In simpler terms, multiplying any number to negative -1 will change its value. Click an empty cell. 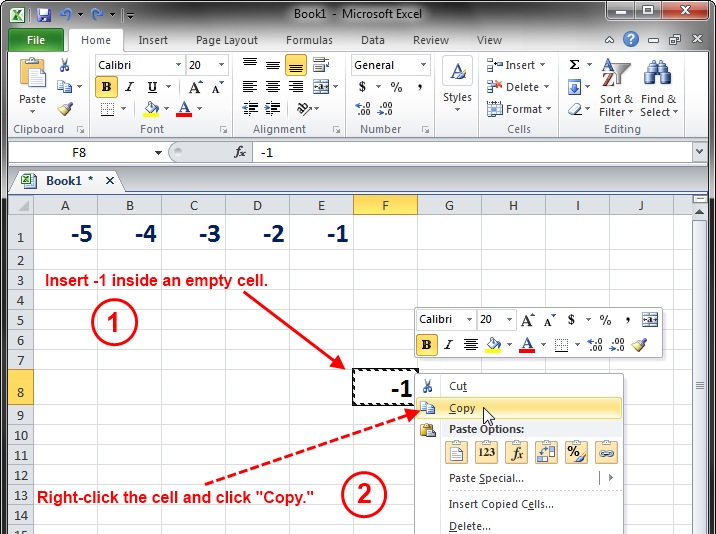 Insert -1 inside the cell you selected (see the image below). Right-click the cell you inserted -1, and click Copy. Highlight the cells with the values you want to change. 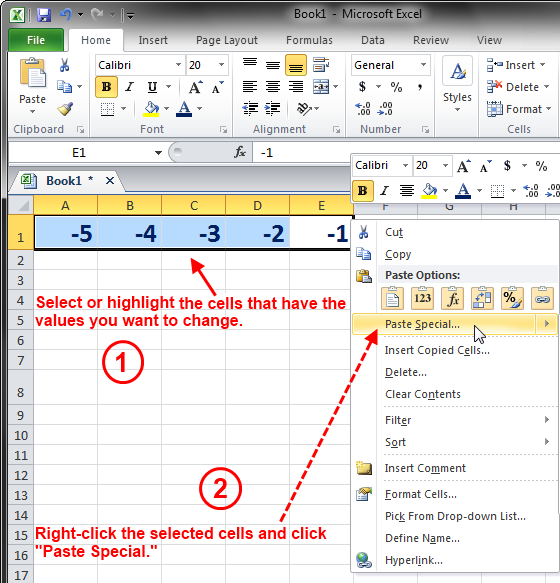 Right-click the highlighted cells and click Paste Special. 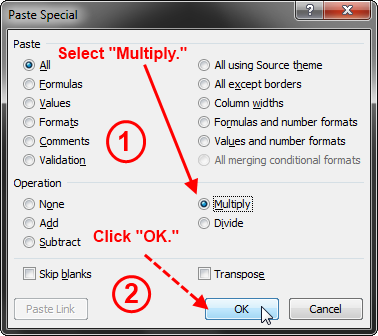 Select Multiply under Operation, and then click OK. Now you will see that all of the values inside the cells will change (see the images below).